Here's what other folks have to say! 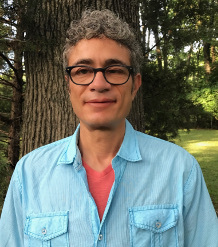 "I don’t remember when I got the courage to tell Rebecca that I hadn’t come on the Shamanic Healers’ Journey to become a healer. After I told her she lovingly replied, “I know”. I had been to Teotihuacan more than once with Rebecca and it was calling me again. Her journey was the right time and, of course, she was the right teacher. I didn’t care about “Shamanic Healing”, I just wanted to go to Teo! It always gives me what I need. With that being said, of course Teo gave me what I needed! It was the perfect journey with the most loving people! My experiences were the next step in my journey. I realized I am a Healer with lots more lessons to learn. Of course, that makes me excited for the next Shamanic Healers’ Journey! 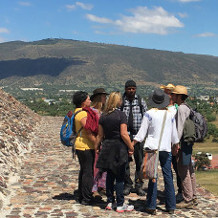 "Every journey I’ve had in Teotihuacan has been an incomparable spiritual experience. 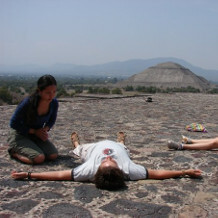 Receiving this with Rebecca, a healer trained in the lineage of Teotihuacan itself, offers an even deeper experience. The healing power summoned through Rebecca left a deep mark in me —beyond my own understanding— bringing to the surface and then to awareness, that which needs to be healed and the opportunity to do so. Since then a broadening awareness of what is permanent or transient, what is reality or illusion, has grown in me. It feels like the time to step forward and learn to walk the path of the healer is here. It is time to see truth and light, and to become truth and light. The wisdom and heritage of the old Mexican Naguales and healers showed up for me, now through Rebecca, and it seems unruly to not accept the gift. It is an opportunity that isn’t always present or available in such an authentic way— a rare possibility manifested and one to which I say, yes!." "For years I had resisted going on a journey to Teotihuacan. My first trip was life-altering (still is!) and life enriching. EVERY facet of my life received benefit from the changes I made thereafter. I returned from Teotihuacan with a deeper understanding of the gifts that Rebecca had given to me. It's as if the teachings finally became integrated into my spirit and simply became a way of being; a way of knowing. I've taken trips since, both to learn healing and to heal myself, and each time I am renewed, re-born, and completely in love with life. To learn this healing lineage from Rebecca is such a powerfully authentic way to discover yourself as a healer. She understood my self-doubt and gave me tools to move through it. She really encouraged me by sharing her own, very real, journey. She continues to be an amazing guide in my life and in my work with clients." "I've thought of Rebecca often since attending my first journey with her and am so grateful for her facilitation of some of the most powerful and profound experiences I've had. 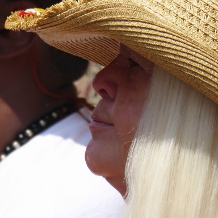 Rebecca, the wisdom and love she embodies, and the energy of those sacred sites continue to be with me. I'm thankful for the deep sense of connection to others and all of life that I experienced so strongly and which I continue to experience. There are so many things for which I am thankful: an intense appreciation for the beauties that there are, a deep sense of joy and laughter, the experience of a different relationship to this body in which I dwell and a clearer perspective of who/what I am. So thank you, Rebecca, for being fully who you are, such a beautiful embodiment and channel of the divine ground." "I traveled to Teotihaucan because I wanted deep transformation, to forgive, to let go of the past and to find a deeper connection with the divine feminine. Rebecca, Mother Sarita, the loving field of energy of the group and Teotihuacan helped me resolve the past, open my heart and deepen my awareness of the field of loving consciousness that is always around us. I received a transmission of high energy from Rebecca that was so loving and blissful. I felt love, joy and peace as I never felt before. It is an experience I will never forget and I will always be grateful for her healing. When one feels that Love, it gets transmitted to others with every interaction we have. It is something I continue to bring into my awareness daily, moment to moment. I thank you, Rebecca!